Roshanpour, N., Darzi, M., Haj Seyed Hadi, M. (2014). Quantity and Quality of Essential Oil of Basil (Ocimum Basilicum L.) Under Biofertilizers Application Conditions. International Journal of Advanced Biological and Biomedical Research, 2(6), 2134-2142. Nazanin Roshanpour; Mohammad Taghi Darzi; Mohammadreza Haj Seyed Hadi. "Quantity and Quality of Essential Oil of Basil (Ocimum Basilicum L.) Under Biofertilizers Application Conditions". 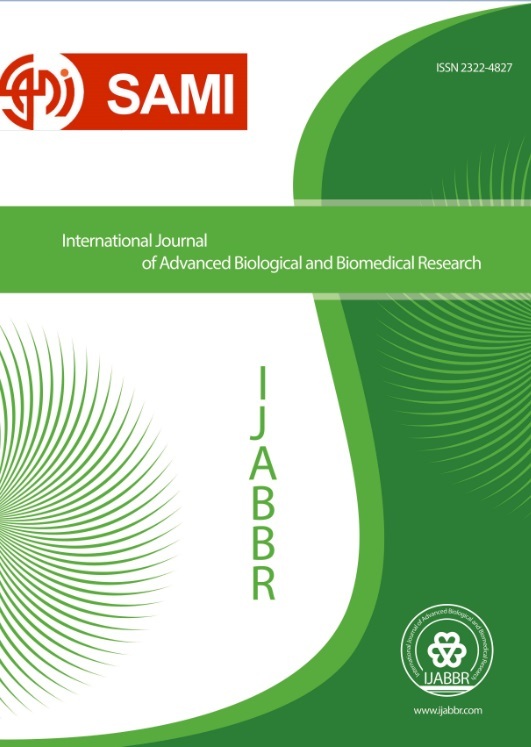 International Journal of Advanced Biological and Biomedical Research, 2, 6, 2014, 2134-2142. Roshanpour, N., Darzi, M., Haj Seyed Hadi, M. (2014). 'Quantity and Quality of Essential Oil of Basil (Ocimum Basilicum L.) Under Biofertilizers Application Conditions', International Journal of Advanced Biological and Biomedical Research, 2(6), pp. 2134-2142. Roshanpour, N., Darzi, M., Haj Seyed Hadi, M. Quantity and Quality of Essential Oil of Basil (Ocimum Basilicum L.) Under Biofertilizers Application Conditions. International Journal of Advanced Biological and Biomedical Research, 2014; 2(6): 2134-2142. The main objective of this study was to determine the effects of biofertilizers on quantity and quality of essential oil of basil essential oil content, geranial, caryophyllene, caryophyllene oxide and methyl chavicol in essential oil. The experiment was carried out as randomized complete blocks design with eight treatments and three replications at research field of Agriculture Company of Ran in Firouzkuh of iran in 2012 . The treatments were  Azotobacter chroococcum (A),  Azospirillum lipoferum (B),  Bacillus circulans (C),  A + B,  A + C,  B + C,  A + B + C and  control (without fertilizer application). The present results have shown that the highest essential oil content and the minimum caryophyllene oxide in essential oil were obtained after applying each three bioertilizers (A + B + C). The maximum geranial in essential oil and the minimum caryophyllene in essential oil were obtained by using two biofertilizers (A + C). Also, the highest methyl chavicol in essential oil was obtained after applying two biofertilizers (B + C).